He was the first Shogun not born in Edo castle and brought up to become a Shogun. Thus his views on life were quite different from the Tokugawa Shoguns before him. Since he lived with the common people in his youth in Wakayama, he knew about the problems of the poor and tried to improve their lot throughout his life. ... the eighth shogun of the Tokugawa shogunate of Japan, ruling from 1716 until his abdication in 1745. He was the son of Tokugawa Mitsusada, the grandson of Tokugawa Yorinobu, and the great-grandson of Tokugawa Ieyasu. Yoshimune succeeded to the post of the shogun in Shōtoku-1 (1716). His term as shogun would last for 30 years. Yoshimune is considered among the best of the Tokugawa shoguns. Yoshimune established the gosankyō to augment (or perhaps to replace) the gosanke. Two of his sons, together with the second son of his successor Ieshige, became the founders of the Tayasu, Hitotsubashi and Shimizu lines. Unlike the gosanke, they did not rule domains. Still, they remained prominent until the end of Tokugawa rule, and some later shoguns were chosen from the Hitotsubashi line. Yoshimune also tried to resurrect the Japanese swordsmithing tradition. 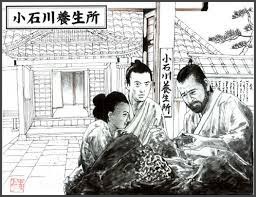 Since the beginning of the Edo period, it was quite difficult for smiths to make a living and to be supported by Daimyō, because of the lack of funds. But Yoshimune was quite unhappy with this situation, causing a decline of skills. 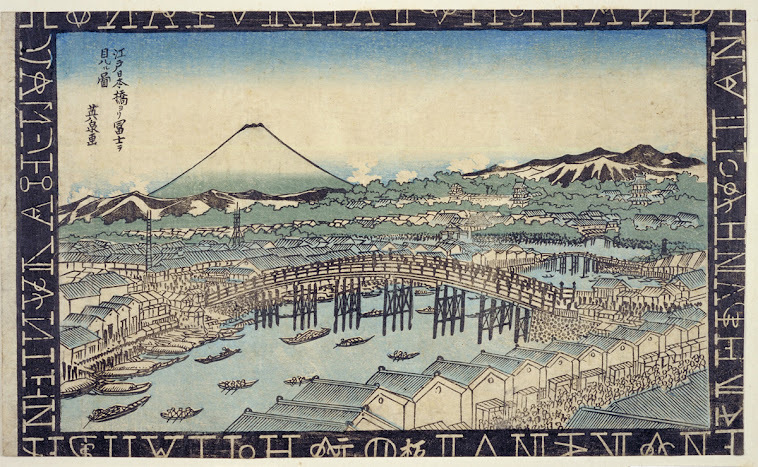 And so, he gathered smiths from Daimyō fiefs for a great contest, in 1721. The four winners who emerged were all great masters, Mondo no Shô Masakiyo (主水正正清), Ippei Yasuyo (一平安代), the 4th generation Nanki Shigekuni (南紀重国) and Nobukuni Shigekane (信国重包). But it didn't worked well to arouse interest, quite like tournaments in modern Japan. Yoshimune also ordered the compilation of Kyōhō Meibutsu Chō (享保名物帳), listing the best and most famous swords all over Japan. This book allowed the beginning of the Shinshintō period of Nihontō history, and indirectly contributed to the Gassan school, who protected the Nihontō tradition before and after the surrender of Japan. Although foreign books had been strictly forbidden since 1640, Yoshimune relaxed the rules in 1720, starting an influx of foreign books and their translations into Japan, and initiating the development of Western studies, or rangaku. In 1745, Yoshimune retired, took the title Ōgosho and left his public post to his oldest son. The title is the one that Tokugawa Ieyasu took on retirement in favor of his son Hidetada, who in turn took the same title on his retirement. Yoshimune died on the 20th day of the 5th month of the year Kan'en-4 (July 12, 1751). ..... The ritual protocols and procedures surrounding Yoshimune's accession to the position of shogun are an oft-cited example of shogunal ritual, and in particular of shogunal proclamations (宣下, senge), the most important type of ritual in the Tokugawa Book of Rites (Tokugawa reiten roku). Only he had to key to open it, thus hearing the voice of the people directly and giving them a chance to complain about their superiors. The petition box was a process employed at various times and places, notably in Edo period Tosa han, to allow members of society, regardless of their status, to have their comments and suggestions heard by the lord. ..... 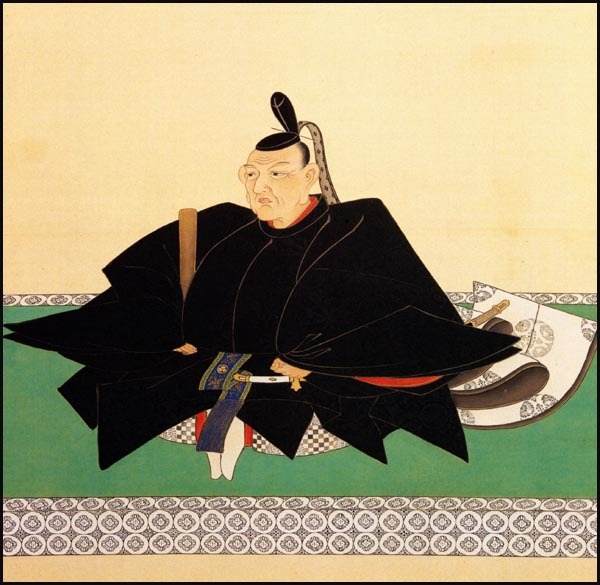 The first shogun to implement a petition box system was Tokugawa Yoshimune. He did so in 1721, after having overseen a similar system as daimyô of Wakayama han, installing the box in front of the hyôjôsho (judicial offices). 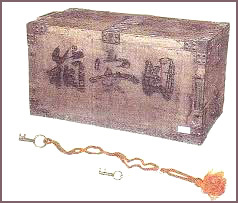 Prior to this, people often petitioned the shogunate illegally, through petitions known as osso (direct appeals to high officials) and sutebumi (anonymous petitions left at the gates of the castle); the creation of a petition box allowed for a legal avenue for such grievances to be expressed. with free treatment for all and a large herb garden for medicine. ... The hospital was established in 1722 by the shogun Tokugawa Yoshimune in the herb gardens of what is now the Koishikawa Botanical Gardens at the suggestion of the town physician Ogawa Shosen. The hospital offered its services only to the indigent. 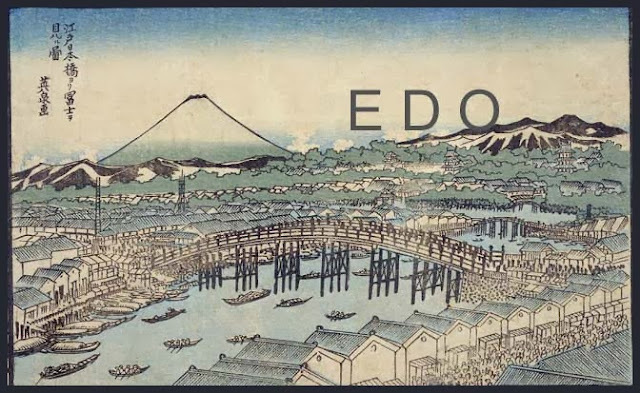 It was eventually merged into Tokyo University's medical school.
. - Edo 江戸 the Castle Town - . ..... Yahei studied large-scale fireworks and showed his marvelous works at the Water God Festival in 1717. When the country suffered many deaths due to famine in Kansai (west) and cholera in Edo, the 8th shogun Tokugawa Yoshimune held a Water God Festival at Sumida River to console the souls of the dead, with Yahei’s fireworks. This is said to be the beginning of Sumidagawa Fireworks that continues to attract millions of people in Tokyo today.
. HANABI 花火 Japanese Fireworks - Introduction . 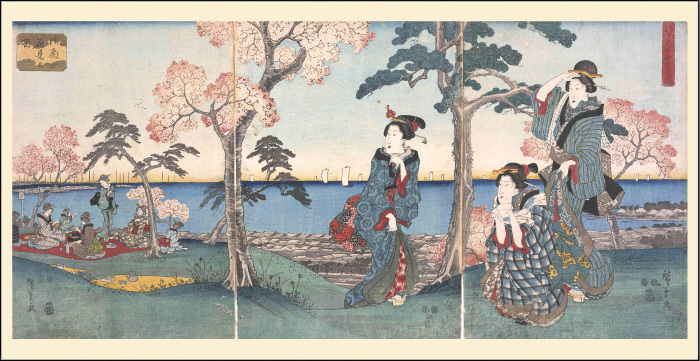 hanami　花見 cherry blossom viewing and merrymaking. He wanted to give the townspeople a chance to enjoy life. The most famous spots are 飛鳥山 Asukayama, 御殿山 Gotenyama, Koganei and Mukojima. The ladies wore special Hanami Kimono for the occasion.
. hanami bentoo 花見弁当 Bento lunch box for blossom viewing . 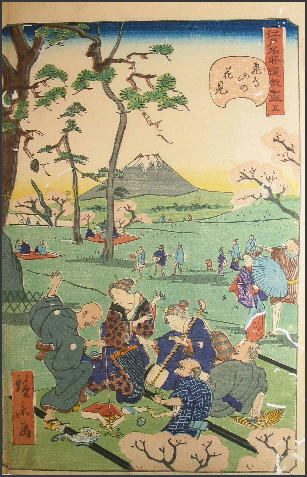 In the early eighteenth century, shogun Tokugawa Yoshimune planted many cherry trees in the area and opened up the land for the enjoyment of the "Edokko" or citizens of Tokyo. The park was formally established, alongside Ueno Park, Shiba Park, Asuka Park, and Fukagawa Park, in 1873 by the Dajō-kan, as Japan's first public parks. shinden kaihatsu 新田開発 reclamation projects. He also initiated reforms for the use of koban 小判　gold money.
. shinden kaihatsu　新田開発 developing new farm land . 12 Samurai throughout the realm are to practice frugality.
. Ohanajaya お花茶屋 Ohanajaya district Katsushika . Hanafuda flower trump card for the letter よ YO - Yoshimune. as a Japanese samurai in the service of the Tokugawa shogunate. During the reign of Tokugawa Yoshimune, as a magistrate (machi-bugyō) of Edo, his roles included chief of police, judge and jury, and Yamada Magistrate (Yamada bugyō) prior to his tenure as South Magistrate (Minami Machi-bugyō) of Edo. With the title Echizen no Kami (Governor of Echizen or Lord of the Echizen), he is often known as Ōoka Echizen (大岡越前). He was highly respected as an incorruptible judge. In addition, he established the first fire brigade made up of commoners, and the Koishikawa Yojosho (a city hospital). Later, he advanced to the position of jisha bugyō, and subsequently became daimyo of the Nishi-Ōhira Domain (10,000 koku). ..... Ōoka Tadasuke has been the central character in two jidaigeki television series. In one, Ōoka Echizen, actor Gō Katō played the lead. In the other, Meibugyō! Ōoka Echizen, Kinya Kitaōji played the same role. In addition, series such as Abarenbo Shogun have portrayed Ōoka as an intimate of the shogun Tokugawa Yoshimune.
. Akasaka Hitotsugi choo 赤坂一木町 / 一ツ木町 Edo . Around 1696, the residence of the city magistrate 大岡忠相 Oka Tadasuke Echizen no Kami was located here. The 豊川稲荷 Toyokawa Inari Shrine in the compound is still there now. aberenbo Shogun 暴れん坊将軍 "The Wild Shogun". He was rather large for his times and very strong, throwing huge Sumo wrestlers in the sand like nothing in his youth. a Japanese television program on the TV Asahi network. Set in the eighteenth century, it showed fictitious events in the life of Yoshimune, the eighth Tokugawa shogun. The program started in 1978 under the title Yoshimune Hyōbanki: Abarenbō Shōgun (Chronicle in Praise of Yoshimune: The Bold Shogun) who went after rogue Councillors and Daimyo who were abusing their power. After a few seasons, they shortened the first two words and ran for two decades under the shorter title until the series ended in 2003; a two-hour special aired in 2004, and then restarted from Oct. 13, 2013 at 7:00PM (Japan time) and still runs today. 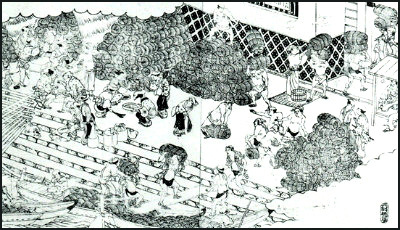 The earliest scripts occasionally wove stories around historic events such as the establishment of firefighting companies of commoners in Edo, but eventually the series adopted a routine of strictly fiction. Along with Zenigata Heiji and Mito Kōmon, it ranks among the longest-running series in the jidaigeki genre. Like so many other jidaigeki, it falls in the category of kanzen-chōaku, loosely, "rewarding good and punishing evil." The goyō toritsugi (御用取次) (his reform of the soba yōnin (側用人) was a Hatamoto person who scheduled appointments for the Shogun. He is generally a man of advanced years. In the first two casts, the character's name was Kanō Gorozaemon (played by comic Ichirō Arishima). 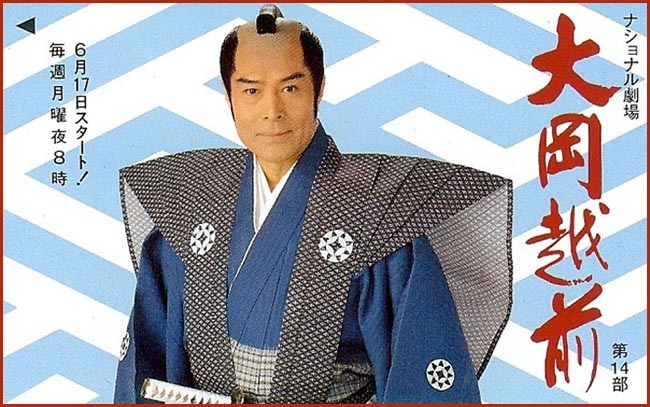 Next came Tanokura Magobei (Eiji Funakoshi), and a few followed in the cast changes of the last years of the show. Jidaigeki (時代劇) is a genre of film, television, and theatre in Japan. 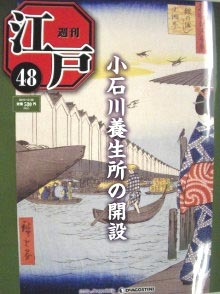 Literally "period dramas", they are most often set during the Edo period of Japanese history, from 1603 to 1868. 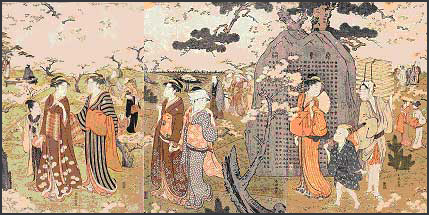 Some, however, are set much earlier—Portrait of Hell, for example, is set during the late Heian period—and the early Meiji era is also a popular setting. Jidaigeki show the lives of the samurai, farmers, craftsmen, and merchants of their time. 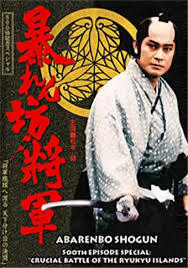 Jidaigeki films are sometimes referred to as chambara movies, a word meaning "sword fight", though chambara is more accurately a subgenre of jidaigeki. Jidaigeki rely on an established set of dramatic conventions including the use of makeup, language, catchphrases, and plotlines.